Last week, teachers, leaders and staff from Catholic Education convened at in Manuka, Canberra, to present their solutions for improving our schools. Seven Studio Curious design teams focused on improving student outcomes for the system. ‘We know that for any school or system to improve its performance, they need to adapt the global evidence and create solutions that respect the unique context of their particular schools’, said Ross Fox, Director of Catholic Education Canberra-Goulburn. ‘The best people to co-design these solutions are the people who will be implementing them on the ground.’ Studio Curious was delivered in partnership with Knowledge Society. On 21 May, the teams presented the prototypes they developed to their colleagues and a panel of guests including Ross Fox, Director of Catholic Education; Angus Tulley, Deputy Director of Catholic Education; Mark Huxley, Executive Director of School Improvement at the ACT Education Directorate; Dr Bill Maiden PSM OAM, Chair of the ACT Teacher Quality Institute Board; Tom Lowrie, Centenary Professor at Canberra University; and Patrick McArdle, Campus Dean of Australian Catholic University, Canberra. In preparation for the wrap-up day, team members worked hard to develop their ideas and test them ‘on the ground’ with leaders and teachers. This is key to the effectiveness of the Studio Curious design process — testing potential programs and services with the people we are designing for and making changes and adaptations as we learn what works best to meet the needs of our students and staff. Studio Curious is an evidence-informed design process. Read more about the journey. During the presentation, each team had the opportunity to share their experience of the Studio Curious process and what they learned through conducting design research, generating ideas, creating a prototype and testing their prototype. Crucially, the solutions were informed by the evidence base — the things we know have the greatest impact on student learning outcomes. ‘Starting with the evidence base is critical, otherwise design solutions miss the target,’ said Ross Fox. Studio Curious seeks to achieve the ‘whole system change’ embraced in places like Ontario, Canada, by engaging people from different levels of the system in evidence-informed design instead of the old ‘top-down’ model, where states or systems ‘prioritise’ and then ‘implement’ change. ‘The opportunity to collaborate on projects that will make a difference to our work in class with principals and teachers from other schools — working with the evidence and learning how to create new solutions — has been amazing,’ said Melanie Stratford, a teacher at St Benedict’s Primary School, Narrabundah. ‘People don’t realise that it is not normal for teachers to collaborate — and it should be,’ she explained. Studio Curious is only the start of this education system’s journey to improve performance and strengthen mission. As the work of Studio Curious continues, teachers and school leaders will always be involved in the process. Staff from the system can volunteer to keep participating in the Studio Curious projects on a flexible basis. This could involve conducting design research or other research at your school; testing prototypes; or actually being a pilot school for a future program that comes out of Studio Curious. We are deeply grateful to Studio Curious participants for their ideas, time and hard work, everyone who has participated in interviews, workshops and design research, and the schools that have volunteered teachers and leaders for the initiative. The Performance team developed seven prototypes to improve student performance in three challenge domains: instructional leadership, teacher capacity and ‘making time for what matters’. Madonna Pianegonda, Catholic Education, Liam Stakelum, St John Paul II College and Melanie Stratford, St Benedict’s Narrabundah, presenting their prototype ‘Instructional Leadership Academy’ (not pictured — Caz Perryman, Saint Joseph’s, O’Connor). An instructional leader is someone — a principal or teacher-leader — who feels personally accountable for measurably raising the standard of instruction in every classroom. This person knows, on a daily basis, how well the teaching and learning is proceeding in every classroom and oversees a consistent approach to pedagogy in the school implemented through collaborative structures. We know that quality instructional leadership can lift the standard of teaching in a school. Many teachers and assistant principals have the personal attributes of an instructional leader, but not necessarily all the skills and knowledge. Personal qualities like empathy, candour, emotional intelligence and drive are all essential, but not sufficient, to be an effective instructional leader. This group’s challenge became, ‘how might we empower and upskill the next generation of instructional leaders?’ They conceived the Instructional Leadership Academy to help teachers, coordinators and assistant principals to reach their potential by showing them what great instructional leadership looks like and teaching them the skills and knowledge they need. This idea is about enabling participants to ‘learn on the job’ in schools and embedding professional learning into their daily routine, instead of one-off courses run offsite. The offering comprises a combination of professional learning from a qualified coach in the individual’s own school environment, shadowing a mentor — an accomplished instructional leader — in his or her school and an online self-paced training course. This group created a prototype brochure to test their idea with principals and potential aspiring instructional leaders. This was a rich process, which helped the group fine-tune aspects of the academy such as when nominations should occur to allow schools enough time to plan ahead, when the successful candidates should commence the process and how participants of the Instructional Leadership Academy community will support one another. By tailoring support to each school’s individual context, this group is avoiding a one-size-fits all model. ‘Instructional Leadership Academy’ prototype brochure used to test the concept with principals and aspiring instructional leaders across the system. This group focused on the challenge ‘how might we reduce the time spent on things that don’t have a positive impact on student learning?’. The best way to improve the impact we have on every student is to make time for great teaching. This group’s interviews confirmed what we are all acutely aware of — that ‘teachers are very time poor and overburdened’, and ‘don’t have the time to plan and engage collaboratively’. If teachers had more time to spend on school-based professional learning and collaborative practice, they could improve their classroom practice and impact on student outcomes. Their idea, ‘Making Time for Improvement’, helps the whole school reduce the things that do not have an impact on classroom learning by appointing an improvement coach in the school who highlights and challenges unnecessary activities and provides recommendations and support to make changes. The group tested a ‘time tool’, which can be used to collect and analyse data on the amount of time spent on activities, identify key trends and make recommendations for change informed by evidence on ‘what works’ to increase time for teaching and learning. The feedback from schools was overwhelmingly positive. Many things ‘creep’ into daily life that ultimately detract from the most important thing at a school — teaching and learning. The ‘Making Time’ solution isn’t about abandoning the activities that strengthen a school community, but raising the consciousness of teachers and leaders about where they spend their time so that they can make better decisions. An online hub that helps teaching teams improve their classroom practice by providing active, collaborative and scaffolded online exercises and tools that support them to deepen their curriculum knowledge (plan together, teach together, reflect together and use inquiry pedagogy). How might we support teachers to improve their curriculum knowledge? This group focused on building the capacity of teachers across the system. Their research uncovered that when teachers discuss the curriculum, their conversations are often conducted in a ‘vacuum’. 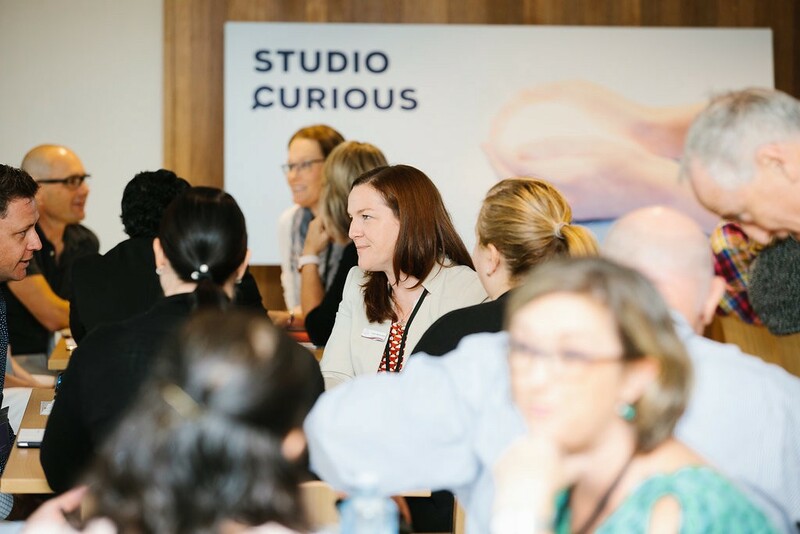 Teachers from New South Wales in particular find the curriculum complex and, given how much content there is to cover, struggle to ‘scratch the surface’ in professional conversations. The group asked: ‘if more teachers in our system had deeper curriculum knowledge, could they improve their classroom practice (i.e. knowing the best pedagogical approaches to use and using them well in the classroom), including their ability to practice inquiry learning and better understand the synergy between assessment and instruction?’ To test this question, they created an online hub with resources for every year level and subject to help teaching teams unpack the curriculum and investigate their practice as part of a collaborative inquiry. An example of a Deep Curriculum Knowledge team exercise. Teachers can’t practise inquiry if they don’t know the curriculum. Working collaboratively builds deeper understanding. Improvement can happen with a grassroots approach where individual schools have the tools to assist them in deepening teacher curriculum knowledge and practice. Collegially Connected is a coaching program where high-quality teachers visit and work with teachers from other schools in their own classrooms. Throughout the Studio Curious process, many participants and interview subjects identified that ‘expert’ or highly accomplished teachers are not acknowledged in the system or used to improve teacher capacity. In response, this group prototyped a model that aims to improve teacher practice by utilising our system’s highest quality teachers. Collegially Connected aims to help schools — especially small schools who don’t have much time or many resources — gain coaching support and context-specific professional learning. The group demonstrated their prototype back in schools, where they discovered the importance of supporting and training the high-quality teacher. In response, they conceived an intensive ‘bootcamp’ to help good teachers become great coaches. They also added a support-group component to empower regional teachers and prevent burnout. Therese Clancy, St Joseph’s School, Kylie-Anne Swan, St Vincent’s Primary School, Mark Birks, St Mary’s Primary School and Colleen Caddey-Murphy, Catholic Education during their presentation at the wrap-up day. This group recognised that we need to value teaching expertise and keep expert teachers in the system. They suggested that high-quality teachers gain a new formal role and recognition as part of the program. According to the group, the system’s best teachers should lead teaching within and across our schools, and be formally recognised for doing so. A high-quality teacher’s journey through the Collegially Connected program outlining essential steps and touchpoints. No teacher should be an island — as Richard Elmore says, ‘isolation is the enemy of improvement’. One group responded to this challenge head-on with the idea of regional clusters to enhance curriculum knowledge and teacher practice. Regional clusters have never been formed in the system before. The group investigated how teachers might be helped and encouraged to improve their curriculum knowledge and align it with pedagogy, assessment and reporting. Their research uncovered the need for schools to have access to place-based professionals who understand their context and have experience with the appropriate curriculum, as well as professional learning that doesn’t require them to travel long distances, disrupting their time in the classroom. The group discovered that there is still a lot to learn about the logistics and details of this concept, but the outlook is to overcome isolation within and between schools through a spirit of reciprocity, scrutiny and support. The Regional Clusters group prototype — a storyboard from the perspective of a regional curriculum leader called ‘A day in the life of a Regional Curriculum Leader and one of their schools’. The Regional Clusters team testing their prototype during the expo-style session. Central to improving student outcomes is effective instructional leadership and, in a school, the role of the principal as the leader of learning is crucial. This group focused on building the skills, knowledge and confidence of our principals as instructional leaders. They began with a question — ‘how might we change the hearts and minds of our school leaders so that they believe they can create change through becoming more effective instructional leaders?’ and came up with ‘Walk Beside’– a tailored mentoring program that aims to develop principals’ instructional leadership knowledge and skills. After testing their first prototype with a ‘slick’ advertising campaign to attract applicants, the group gained more clarity about how their concept might be designed to appeal to principals. They discovered that the program must make leaders feel valued, competent and supported. Walk Beside would need to recognise a principal’s emotions, start where they are at in their learning, remove some of the demands on their time and support them to focus on the core business of leading learning in their schools. In addition — the ‘slick’ advertising campaign did not appeal to principals whatsoever. With this learning, the group made some adaptations. They created a invitation letter to participants which had a more professional feel and developed a reflective journal to illustrate that the ‘Walk Beside’ mentoring program would be a self-guided process undertaken with a mentor of the mentee’s choice. There are no ‘must-dos’ and no imposed timeframes. Walk Beside is contextual — it’s all about you and your school. The evidence is clear — leaders who focus on instructional leadership have the biggest impact on student learning. Principals, however, wear many hats in a school. They are overburdened with management, administration and compliance. They are busier than principals in other systems — they manage parish relationships, participate in sacramental and pastoral programs and are under pressure related to fee collection. Among this backdrop, it is no wonder principals struggle to find the time to lead the learning in the school or participate in teacher development. The group developed ‘TimeFlip’ — Time For Learning Is Priority — to help ‘win back’ the time of the leadership team through the reallocation of administrative tasks. This would be achieved through a ‘time spent’ analysis by a consultant with educational leadership qualifications and experience implementing similar programs. The time created would be dedicated to high-quality professional learning. The Deloitte ‘Principal Workload and Time Use’ study undertaken by New South Wales Department of Education informed the TimeFlip concept. Props from the TimeFlip group’s ‘many hats of the principal’ role play at the beginning of their wrap-up day presentation. If a school does not have an instructional leader, improvement actions or professional learning aimed at teachers is less likely to improve student learning outcomes. This group identified the need for teachers to view themselves as instructional leaders. They came up with the idea of TasIL — a collaborative professional network for regular informal catch-ups with other educators interested in instructional leadership and practice. The group tested TasIL in-market. Using Meetup, a social network platform, they created a group in Canberra called ‘Teachers as Instructional Leaders’ with a description and opened it, expecting nothing much to happen. Within twenty-four hours they had their first member. Over the course of ten days, eleven teachers quickly joined without the group being marketed. The group concluded that there is an appetite for such a service, but agreed that Meetup was the wrong platform — there are too many advertisements for dating services. TasIL prototype one using meetup, a pre-existing social network platform. Some key design principles guided them through their next iteration on Google+, a common platform for Catholic Education educators. Bernadette Scott, Catholic Education Office, and Breen Fox, St Bede’s Primary School, presenting TasIl at the wrap-up day (not pictured — Anne Staines, Sacred Heart Primary School, Bridgette McCann, St Monica’s Primary School and Chris Beerworth, Mother Teresa Catholic Primary School). Strengthening education performance and Catholic identity across Catholic education in the Archdiocese of Canberra andGoulburn.